As kids, we loved to get together to play with our friends. As teenagers, our world revolved around our friends; oftentimes, our friends dictated our choice of activities. As adults, we still enjoy being active with friends, but don’t always feel like we have the time or opportunities to do so. Group exercise provides us with an opportunity to feel young again and be physically active with others. 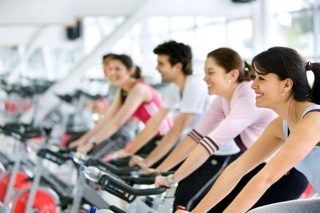 Group exercise is typically described as exercise performed by a group of individuals led by an instructor. A variety of group exercise formats exist, including (but not limited to) aerobics and dance choreographed to music, BOSU, core conditioning, Pilates, yoga, muscle conditioning, step, indoor cycling, kickboxing, sculpting, fall prevention and boot camp. Your choice of classes depends on the club or studio you attend, the expertise of the instructors, and the amount of time you have. A common reason given for quitting an exercise program is boredom. A variety of class formats will keep you motivated and interested, as well as give you different instructor styles, music selection, and interaction with other participants. For many, an hour-long workout goes by very quickly when there is music playing and you are trying new exercises. People stay interested because of the social atmosphere provided by group exercise. This offers camaraderie and accountability among participants, as well as between participants and instructor. Most people know exercise is good for them and want to begin exercising. However, they do not know the first step to take. They are bombarded with urgent messages from the media to exercise, but receive little guidance on how to initiate that process. This can be a very overwhelming task, especially when our lives are hectic. Group exercise offers a workout for all levels, ranging from beginner to advanced. Participants do not need to know how to develop a safe and effective workout or which machines to use or for how long; it is already done for them. They simply have to show up with a positive attitude, participate, and most importantly, have fun. An exercise class structured with a purpose can be beneficial for people with limited knowledge about safe and effective exercise programming. An appropriately designed class includes warm-up, cool-down and flexibility in addition to the conditioning section. When people exercise on their own, they often skip portions of a workout they know less about or are not their favorite to perform. Furthermore, the fitness professional is not only designing the components of the workout, but also the intensity, so the class is designed appropriately to improve cardiorespiratory and muscular fitness. The fitness professional can also serve as a resource for class participants and encourage them to engage in other healthy behaviors outside of class. Many people quit an exercise program because of time constraints. Participating in group exercise may help overcome this obstacle. Some facilities offer 30- and 45-minute classes for individuals with limited time. In addition, the consistency in scheduling offered by group exercise programs allows participants to choose a time and schedule it in their planner as they do other daily activities. Lastly, group exercise appeals to many people because of its diversity. Traditionally, group exercise was available inside a fitness facility in the format of dance choreographed to music. While this still exists, many non-traditional group exercise formats are emerging, some even outside. There are boot camps at your local park, yoga on the beach, ski conditioning at the soccer field, trekking on the bike trails, stroller-walking classes in your neighborhood, and Latin dance at the local recreation facility. Regardless of your passion or interest, what is most important is to move. Group exercise offers an outlet for people to do this while having fun!